Today is the day. I’m going to be hitting the gym after a 2-week hiatus. Now, I did hit it last week doing Craig’s old man warmup, but this time, it’s back to lifting. I promise, I’ll be conservative. But just being honest here, I miss taking my caffeinated stimulant, getting pumped up and gearing up for war. Today’s choice – “Friction” from VPX. Thanks Mr. Supplement guy for the free samples. I thoroughly enjoy my skin tingling and feeling like I can deadlift a semi-truck with my teeth. Good times. I have a client at 10 this morning, and then it’s MY turn. But first, let’s take a peeky at his finisher (Yes, I said “peeky). It’s taken directly from my Bodyweight Chaos Finishers manual, which you get as a bonus when you get Shawna’s Challenge Workouts through this Wednesday. By the way – here’s why. The pull-up is, BY FAR, one of the best exercises you can do to build up strength, work your core, chisel your arms, back and shoulders and drop stubborn fat. But you’ve been afraid to try it because you can’t even perform one, or you’re stuck at 4 and can’t seem to get past that. Look, I was scared of pull-ups, too. But after reviewing Shawna’s program, I was afraid no more. Now, they are a staple in my own programs as well as my clients. Heck, I can remember when I couldn’t eve perform a single rep. I had to jump and do negatives, in which you jump and grab the bar, then take about 5 seconds to come down. Even then, I could only do around two of those. But not anymore. That’s just ONE method, but the out-of-the-ordinary, secret methods are too much in depth to explain here. Her secrets are revealed in her Challenge Workout program. YOU can do more pull-ups. You can look leaner, more athletic and have that V-shaped back. You just have to follow her program, rep by rep, step-by-step. You’ll be shocked at how far you can come in just four weeks. Look, my metabolic resistance training programs have pull-ups in many of them, and I always offer DB Rows or Inverted Rows as a substitute. But NOT you. You’re going to finally step out of your comfort zone and start smoking your friends in pull-up numbers. No more DB and Inverted Rows for you. And the cool part? You’ll get her step-by-step program, and then use my bodyweight chaos finishers at the end of each pull-up improving workout (not all of them… just one – don’t get crazy you freak). What’s a “bodyweight chaos” finisher Mikey? Do tell. This is the finisher my client is going to knock out today. Then, we’ll take a short 5-minute break so he can stop shaking, and then knock out a few photos for an upcoming program. That was ridiculous. Ridiculously awesome. That’s how you finish a workout with a bodyweight superset. Here’s a bonus for you – record the time it takes you to finish this finisher, and the next time you perform this one, try to beat your previous time. What an awesome way to increase your conditioning and athleticism (and don’t give me that “I’m not an athlete” excuse. We all have an inner athlete in us. I still remember my shooting skills back in the day… they were like celebrities and a Rehab clinic… always going in. Ha, I’m hilarious. … then, you’ll get my bonus, “Bodyweight Chaos” Finishers. Forward your receipt to us at cranktraininghelp@gmail.com and we’ll send you the bonus. 1. Get Shawna’s program through the link below at a discount that I asked Shawna to graciously give you. 2. Forward your receipt to us at cranktraininghelp@gmail.com and we’ll send you the bonus Bodyweight Chaos Finishers (but only through Wednesday). 3. Follow her program, step-by-step and improve your pull-up numbers so you can FINALLY break that plateau you’ve been sitting at. 4. 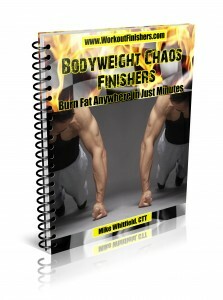 Use one of the finishers from the Bodyweight Chaos Finishers manual at the end of each workout because it’s awesome, that’s why. Four weeks later, let me know about your success with your improvements on your pull-up numbers. I love hearing success stories, that’s why.